Hand-made notebook with simple and easy to find items. Done with black liners – 0.05 and 0.3 mm on a piece of A5 thick drawing paper. Love the dragon art piece. Where did you get the inspiration for it? The notebook seems out of place though. Too artifical, sterile and conventional. the notebook isn’t finished yet. i only showed the interior so you can have an idea on how it was made. and i like simple stuff. it gives me more freedom to change it after. 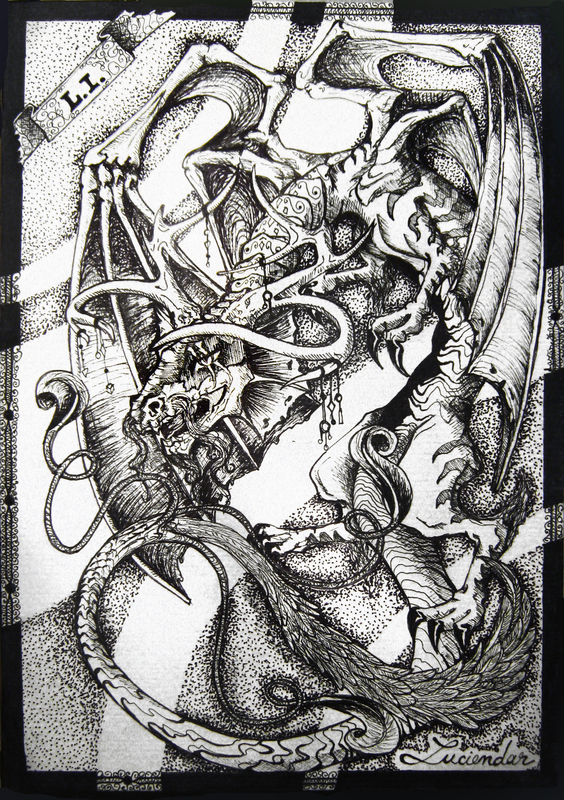 as for inspiration … all i can say is that the dragon represents me. i made it based on how i am. I would love to make a notebook as well, but I have this weird OCD where I think, “What if I run out of pages?” XD What are you gonna use your notebook for? =) That is such an awesome dragon though, I admire your patience and effort. You can always make a notebook like this one 🙂 it’s made so that you can always add or replace pages whenever you want. I’m going to use mine for all sorts of crazy ideas, thoughts, drawings, flat origami etc. Whatever I feel like putting in (I can always change the pages later). And thanks ^.^!